This year’s tournament 1 seeds are, in order, Louisville, Kansas, Indiana, and Gonzaga. The ASC agrees with 3 of actual top seeds–Louisville (1), Indiana (2), and Gonzaga (3). However, my system sees Kansas as significantly overrated, putting them 9th overall on the s-curve. So who replaces the Jayhawks on the top line? Surprisingly, it’s New Mexico. This may sound crazy but the facts are that the Lobos went 29-5 against the 17th-toughest schedule–a tougher schedule than Duke, Georgetown, Kansas, and Miami, all of whom had as many or more losses than the Lobos. Behind New Mexico, three teams were very close: Ohio State, Michigan State, and Duke. Along with UNM, the Spartans were underrated and received a 3-seed. Overall, the ASC was in very close agreement with the actual bracket. Of the top 4 seeds, 14 of the 16 were matches. The only differences were Wiconsin (ASC 4-seed, actual 5-seed) and Butler (ASC 4-seed, actual 6-seed). Those two teams were replaced by Marquette (#17 overall on the ASC, making them the top 5-seed) and Saint Louis (ASC 6-seed). Unbelievably, the ASC agreed with this year’s bracket on all but one team. The ASC would have made Iowa an 11-seed, and in fact I talked about the Hawkeyes case in a recent post. The team I left out was Cal, who was behind only Kentucky (extenuating circumstances with the Nerlens Noel injury) and Stephen F. Austin, who lost only 4 games but played the 331st-ranked schedule. As far as seeding goes, there were a few big discrepancies. The ASC was more bullish on Saint Mary’s (7 seed vs. 11 play-in game) and Oregon (8 vs. 12). The ASC, however, think that VCU (9 vs. 5), San Diego St. (10 vs. 7), Villanova (12 vs. 9) and Oklahoma (13 vs. 10) were all over-seeded. I’m going to switch gears here and instead of my reward-based Achievement S-Curve, I’m going to evaluate the bracket based on my predictive ratings. As an example, I agree that Louisville deserved the #1 overall seed over Indiana based on their wins and schedule, but my predictive ratings say that Indiana would beat Louisville on a neutral court. So, who’s the best team not dancing? That honor goes to last year’s best team, period: the Kentucky Wildcats. Obviously, they come with a massive asterisk, that being the injury to star center Nerlens Noel. Since the committee factors injuries into their evaluations, it’s no surprise last year’s defending champs are staying home (and in fact, regardless of injury, my ASC agrees that they should have been left out). Kentucky ranked 25th in my predictive ratings and the next best team left out, who I’ve already mentioned, is right behind them at 28th: Iowa. The Hawkeyes were a very strong team this year that got caught up in the best conference in recent memory. Other teams that would have been among my top 37 at-large teams if teams were selected solely based on their true strength: Connecticut (37th, ineligible), Baylor (40th), Stanford (47th), and Virginia (48th). 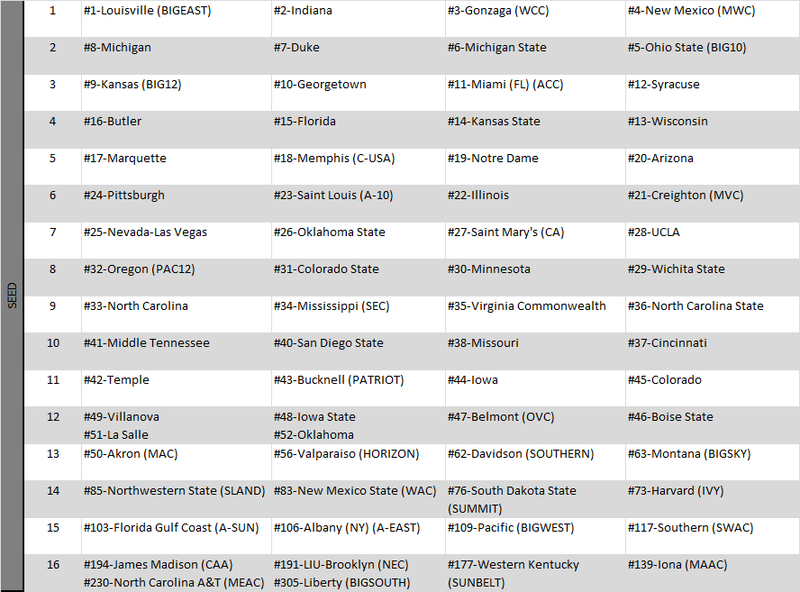 Denver (49th) was also in the top 50 but would have been the 38th at-large team in this ranking. And let’s take a quick look at the flip side: which at-large teams would be left out if we chose teams based not on resume, but on their predictive quality. 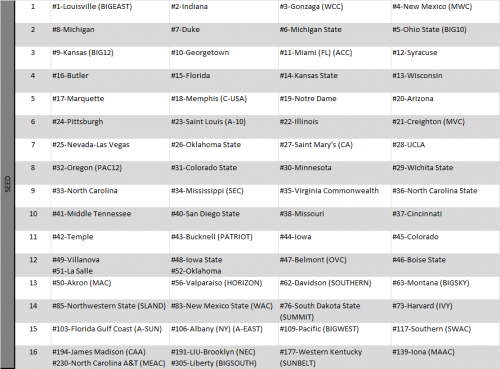 Cal–who my ASC said was the one team that should have been left out–also looks poor in my predictive rankings at #68, the only at-large team outside the top 60. First Four participants Middle Tennessee (60th), La Salle (59th), and Boise State (55th) are the next three on the list. I’ll wrap up by looking at teams that are over or underseeded based on their true strength. Down at the bottom of the bracket, it’s pretty easy to spot the worst teams but Montana stands out as an overseeded team. They check in at 184th best team–fourth worst team in the field–but grabbed a 13-seed. Other teams that might struggle to live up to their seeding include Temple (52nd, 9-seed), Memphis (47th, 6-seed), and Kansas State (43rd, 4-seed). Iona is an underseeded team. As a 15-seed, they rank in the top 100 of my predictive rankings. Other double-digit seeds that appear to be stronger than their seed: Valpo (56th best team, 14-seed), Oregon (35th, 12-seed), Mississippi (33rd, 12-seed) and two severely underseeded 11-seeds in Saint Mary’s (16th) and Minnesota (10th). That wraps things up for my selection analysis. Next up I’ll take a look at the bracket itself and which teams got the easiest and toughest draws. It’s funny to read this — I was making the case for Iowa just today. Friends were complaining that Minnesota was overseeded — and I was arguing that Minnesota is overseeded and in fact Iowa deserved an invitation. Scott, just saw your Iowa post. Interestingly enough, I think they should be in both in my rewards-based system AND in the predictive rankings that you prefer for selection. Basically, I think the committee has trouble correctly adjusting for extreme schedules (or, conversely, my system could be the one with the issues). One thing John Gasaway and I discussed before was selecting based on reward but seeding based on who the “best” teams are. While I prefer my system, having something where Pitt is an 8-seed does seem unfair to Gonzaga.